Modesty Blaise: We always have choices about what we make of ourselves, but we don't always know where those choices will lead. If you are a Modesty Blaise fan, you will know if you have watched this film its miles better than the strange sixties one! but it is a rather low budget film, well almost a no budget film in fact. 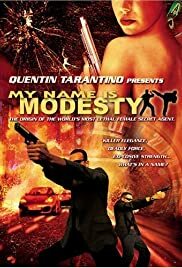 The problem that Miramax the owners of the rights to make a Modesty Blaise film had was they could not agree on a script for the big budget film version of Modesty and their rights to make a film were about to run out. In order to keep the film rights they had to make a film, and this is it. In the past such a film would get shown for one night in the middle of nowhere to show it had been made and shown, and then they would bury it in the film company's vaults never to be see again. The only one they wanted you to see was the big budget version they hope to make soon as they had a script they could agree on. However with with DVD rentals and sales, their is alway the chance to make some money on a DVD of the low budget version however little it cost to make (and this one was shot in 18 days with a director hired one week before shooting !!). However I like it, its not the film of Modesty Blaise I would have expected to see, but it sticks to Modesty's history reasonable well, and for fans the icing on the cake is a 40 minute interview with Peter O'Donnell in the DVDs extras, as well as an annoying one with Quentin Tarantino and his buddy the director at their most infantile. By the way, Quentin Tarantino hopes to direct the big budget version when, and if ever it gets made.